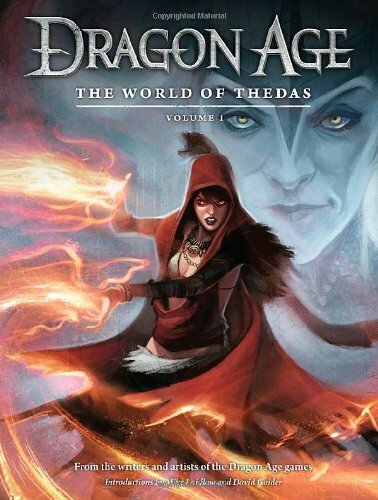 Here's the companion book for the Dragon Age video games. The book's 184 pages, hardcover. While you can actually get most of the information on the Dragon Age wikia page, the book format is more convenient as a package. I'm not familiar with the game so I can't comment much except say that other reviewers on Amazon have pointed out several errors and inconsistency with the content. The contents include Legend, Map of Thedas, Races, Nations, Magic, Religion, The Fade, The Blight and Bestiary. The art featured in the book is wonderful. There are beautiful illustrations of the environment, scenes, characters and creatures. The environments are painted in concept art style - they are not considered really finished but they feel finished and the mood is captured well. The artworks are printed quite big and they are almost on every page. There are several paintings filling two pages. The layout of the book is also nice. It's worth it just to buy for the art alone. And this book reminds me very much of The World of Might and Magic: The Ashan Compendium, which is also a book to get if you're into fantasy art.